Takahashi ambassador Matt Dieterich used an FSQ-106EDX4 on an EM-200 mount to take some excellent astro-images using a full frame DSLR. His work shows what can be done with a high quality telescope and mount and a simple DSLR, without the need for a computer or guiding. Since I started in the hobby of astrophotography in 2007, I have known that quality apochromatic (APO) refractors produce stunning deep-sky images. Refractors are portable and require very little maintenance compared to other telescope designs. For these reasons, I frequently recommend beginners in astrophotography to start out with a refractor. After all, refractors are just large camera lenses with very high-quality glass. Simply put, refractors are fun telescopes to work with and provide beautiful widefield views of the night sky! My passion is widefield imaging of our Milky Way. For images like these, I commonly use camera lenses for their portability and ease of use for creating large panoramas. However, these camera lenses often experience severe coma near the corners and do not have enough focal length for small deep-sky targets. With this in mind, a highly portable refractor setup is ideal for my needs of capturing faint deep-sky objects. For many years, the Takahashi 106mm refractor has been a scope I wanted to pair with my DSLR camera. I had seen numerous APOD winning images captured with the 106mm, which made me want to shoot with this scope even more. Recently, I had the opportunity to shoot with the Takahashi FSQ106EDX4 on their EM-200 Temma II mount. What follows is my firsthand experience using this gear. I took the setup out under the Texas night sky to see just how this scope performs with my full frame Nikon DSLR. I had high expectations for this refractor, and the quality of my first-light images did not disappoint. Setting up the EM-200 and FSQ106 at my field location took all of 10 minutes. I was happy that the mount and scope were lightweight compared to my 8” Newtonian setup. Polar aligning the mount using the built-in polar finderscope was quick and simple after reading the manual. I was very pleased seeing how accurate the polar finderscope was, which provided nearly 10-minute unguided subexposures when testing. I enjoyed being able to leave my autoguiding setup at home when using this mount! The 360-degree rotating camera assembly is built to hold even the largest CCD cameras and filterwheels without flexure. The camera rotator made simple work of framing my target for the session. 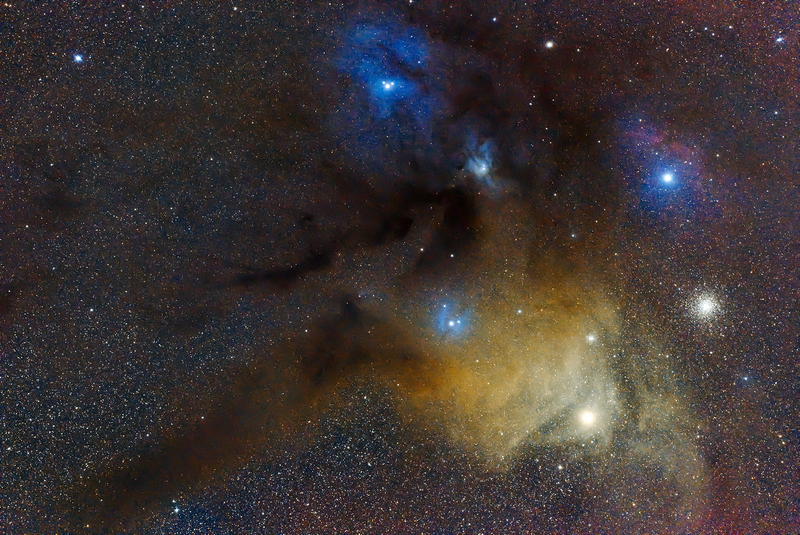 My first light target was the Rho Ophiuchi region, which filled the frame of my Nikon D750. I had the F/3.6 reducer in place which dropped the focal length down from 530mm to 385mm. I captured 17 subexposures at 1 minute in length using ISO 1600. The large image circle of 88mm illuminated my full frame sensor with ease. Minor vignetting was removed using flat frames during data reduction. 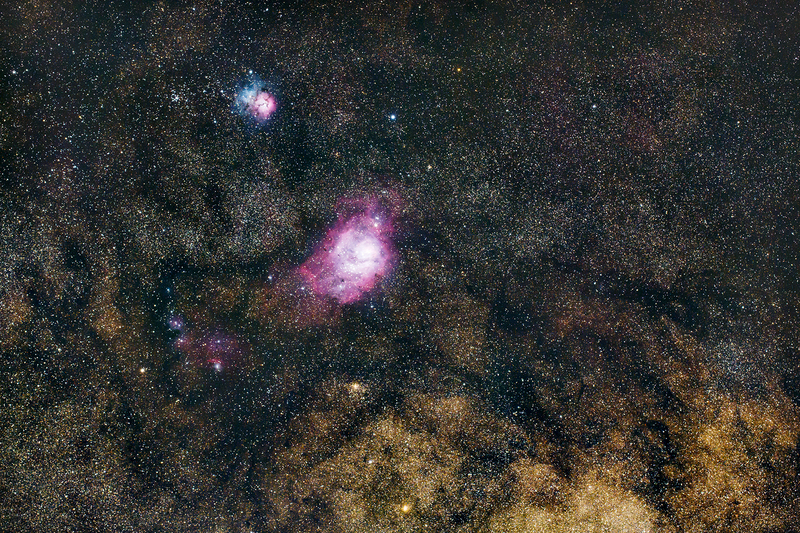 To show just how much light this scope gathers with the F/3.6 reducer, I also captured a single 60 second image of the Lagoon Nebula seen below. Overall, shooting with the Takahashi FSQ106EDX4 and EM-200 Temma II mount was enjoyable and left me wanting to shoot under darker skies. The build quality of the gear proved why Takahashi is an industry leader. Plain and simple, their gear is really meant to last, which is comforting since the price tag is steep. My highlights for this setup come down to the portability, ease of use, and data quality. I really liked how portable the mount and FSQ106mm is for travelling to dark-sky locations. The polar finderscope accurately locks on the celestial pole resulting in unguided subexposures of nearly 10 minutes. Most importantly, the optics fully color correct and provide pinpoint stars from edge to edge on my full frame DSLR sensor. One drawback I noticed with the EM-200 mount is that the hand controller does not come supplied with goto. The goto equipped hand controller can be purchased separately, but it would be best if it came standard with the mount. As a workaround for goto function, most folks online are connecting to the mount via a WiFi adapter and using tablet with planetarium software (i.e. SkySafari). In short, I was blown away at the quality of the Takahashi FSQ106EDX4 and the resulting images. This scope is simply fun to shoot with, thanks in part to the portability and quality Takahashi is known for. Matt Dieterich is passionate about night sky photography. When he first witnessed the Milky Way at night in 2008 from Glenwood Springs, Colorado he was instantly hooked. The experience of being outside at night under thousands of stars with the Milky Way strewn across the sky was captivating. Growing up in Pittsburgh, PA Matt did not know what dark night skies were. To this day, bright city lights continue to degrade the night sky to the point where nearly 75 % of society cannot view the Milky Way from where they live. 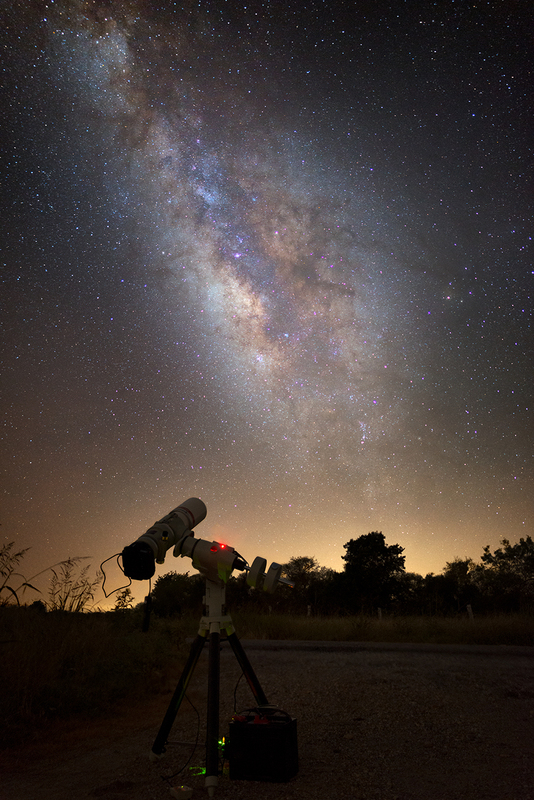 Matt’s goal is to bring attention to the beauty that exists above our heads in the night sky away from these city lights and to inspire children and adults to continue the tradition of stargazing.